We have used the Long Baseline Array to observe the Circinus Galaxy H2O megamasers on two epochs separated by 49 d. The masers were observed to be highly variable, consistent with previous studies. We observe rapid variations in the linewidth and central velocity of the maser's spectral profile. The characteristics of these spectral variations suggest that the masers have an anisotropic structure, with axial ratios ≲5, and display velocity gradients in their microarcsecond structure. We also find a strong anticorrelation between the linewidth and the modulation index of the maser features and a relationship between the modulation index and characteristic time-scale of the variations. These various phenomena can all be simply explained through a model where the rapid variations in the masers are produced by quenched diffractive scintillation in the presence of modest velocity gradients in the maser emission. 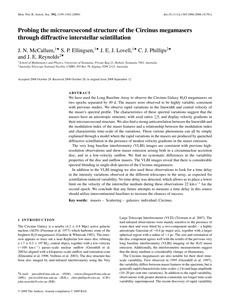 The very long baseline interferometry (VLBI) images are consistent with previous high-resolution observations and show maser emission arising both in a circumnuclear accretion disc, and in a low-velocity outflow. We find no systematic differences in the variability properties of the disc and outflow masers. The VLBI images reveal that there is considerable spectral blending in single-dish spectra of the Circinus megamasers. In addition to the VLBI imaging we also used these observations to look for a time delay in the intensity variations observed at the different telescopes in the array, as expected for scintillation-induced variability. No time delay was detected, which allows us to place a lower limit on the velocity of the interstellar medium during these observations 22 km s−1 for the second epoch. We conclude that any future attempts to measure a time delay in this source should utilize intercontinental baselines to increase the chances of success.